Lucas Mill produces two slabbing options – the Dedicated Slabber and the Slabbing Attachment. For full-time slabbing operations, or cases where the operation will change from circular to slab milling regularly, the Dedicated Slabber is recommended. For those more focused on cutting boards and beams, but still wanting to have the slabbing option available, the attachment is a hassle free and cost effective alternative. The Dedicated Slabber comes standard with a 16 H/P manual start Briggs and Stratton engine. Customers have the option to upgrade their engine to a 20 H/P with electric start. This option is recommended when larger slabbing bars are chosen. As a complete set-up, the Dedicated Slabber includes end-frames and rails, the same as are provided with the circular swing-blade mills. 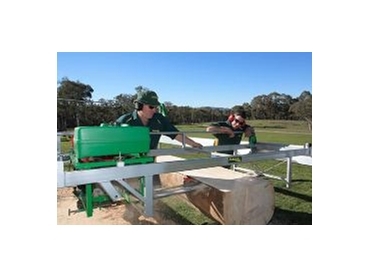 Dedicated Slabbing Mills can also be purchased as a trolley only addition to any pre-existing Lucas saw milling set-up. This option is ideal if you are planning to engage in a lot of both slabbing and circular swing-blade milling.